Over the past couple of days I submitted two entries to the painting challenge. The first was one of the projects that I have most been looking forward too this year, the creation of a Mechanicum army for Warhammer 30k. 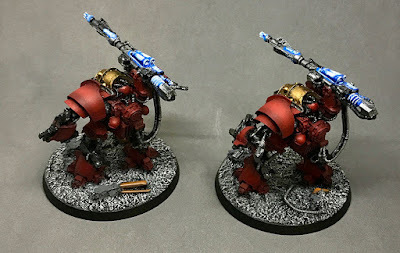 I have looked at the Mechanicum force for years and loved the overall look of the robot portion of the army, but just hated other portions of it. 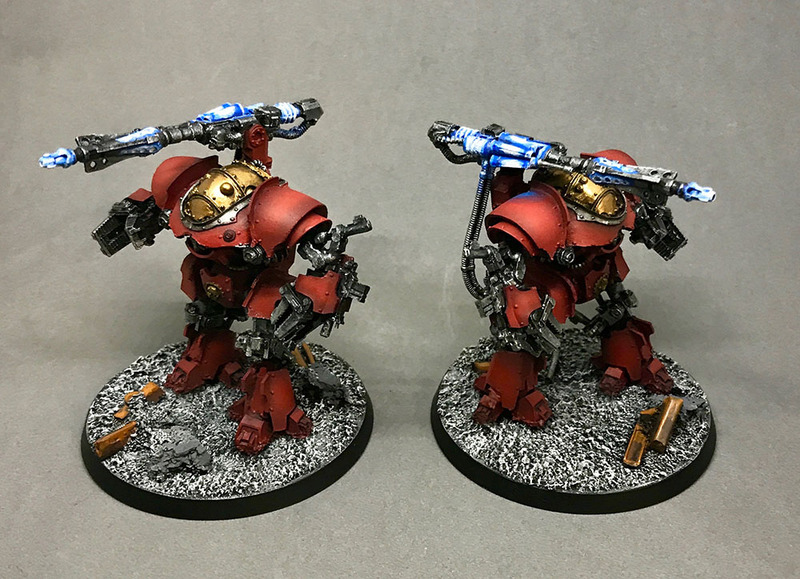 Enter the Legio Cybernetica list this past year, which is a Taghmata variant that focuses on robots! Hurray! I can make a list with just robots, sign me up! I love the bonkers look of these walking death machines, and love the fluff even more. You basically have the masters of technology sitting on Mars thinking that people are idiots and machines are great, so lets turn people into machines. Sounds great to me, since as a techie I trust machines far more than I trust people! 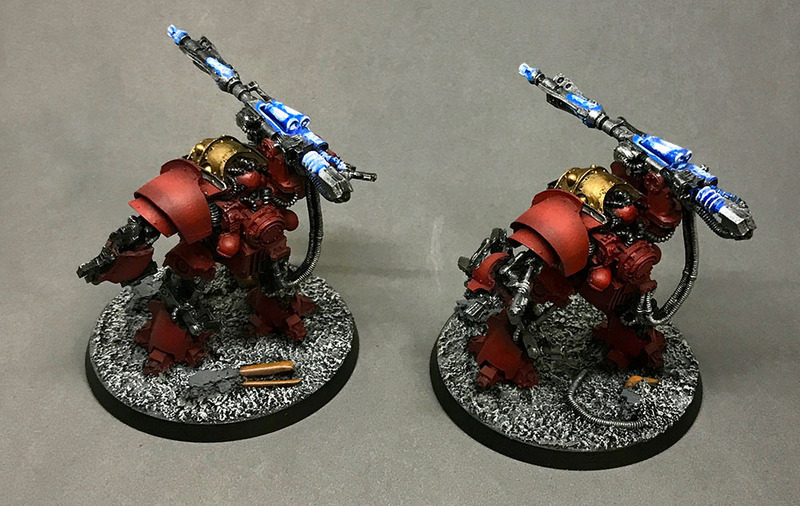 This is the first batch of two Castellax Class Battle-Automata that I finished and they are wielding the evil looking Dark Fire Cannon. I honestly have no idea WTF they do in the game, I just got them because I liked the look of them! Once the force is done and they have to go on the table, I will have to look them up. Overall I am just aiming for effect on these and not going to spent a ton of time on them. I am aiming for game pieces not show pieces so a lot of the details are not getting painted, I am using a lot of shortcuts and quick steps on them, nothing special close up, but hopefully good looking on the game table. 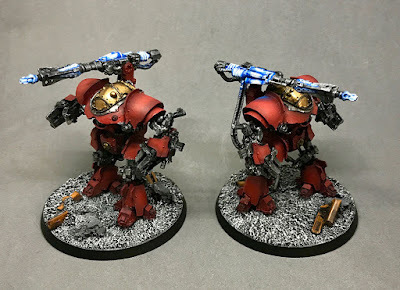 I wanted the entire force to look the same, especially with the reds which I find very hard to get looking right, so I have airbrushed all of the models I have all at once, and will be working on the details of small batches of them over the course of the challenge. 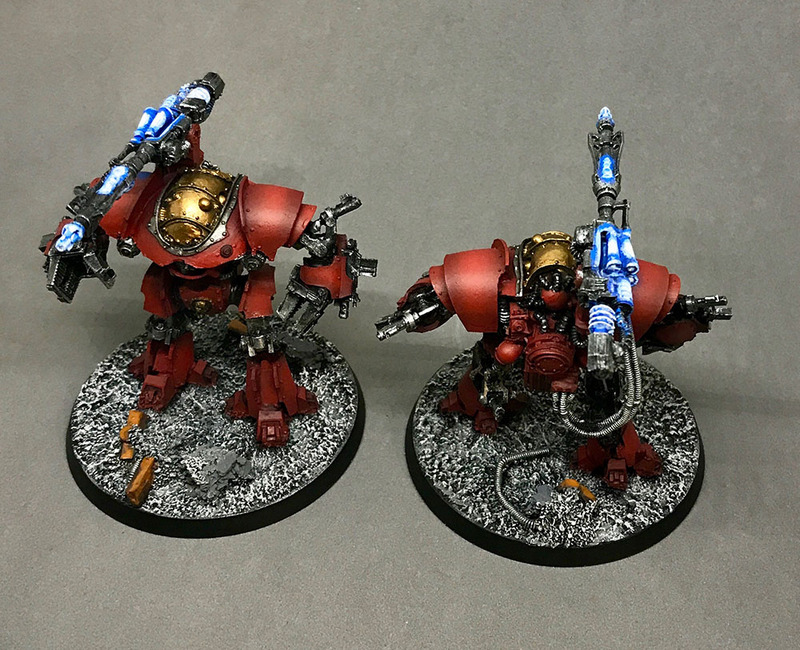 I airbrushed all the reds, then touched up the black areas, then painted the silver. At this point I was almost done, but something just didn't look right. There was too much silver and red and no contrast colours. While I had not planned on any other colours, I felt it needed something so went back and added some quick energy blooms on the weapons in a blue to white fade to try and show high energy expenditure. Not sure if blue / white was the right colour choice or not, but it certainly stands out, which is what I was looking for. Last up was the bases. I had initially planned a red martian soil base, but thought it would just blend the model to the base rather than making it stand out. I changed it last minute to a simple black / grey rubble base using cork, bits of sprue, guitar string, plasticard, and liquitex. 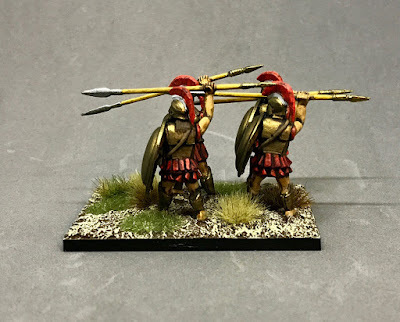 Last year I decided that I wanted to do something for this challenge that would allow me to get a bunch of figures done fairly quickly and bring a new era to our wargame group. The era I chose was one that has interested me for a long while, Ancient Greece. 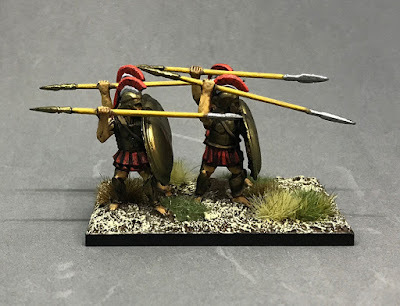 Well, those expectations meant nothing, as Warlord has 3 different boxes of ancient Greeks, all advertised as different things, yet all of them have the same contents other than a few small character sprues and decals. Worse, the poses are not varied at all, and have no thrusting arms only throwing arms or at rest arms. The sprues used by Warlord are old Immortal figures sprues and are not even really 28mm they are more like 25mm figures. I have since ordered a few boxes of Victrix Greeks as they have proper thrusting arms and more varied poses, and will mix them into other units and try to keep the same height by leaving the Warlord figures on their bases and removing the Victrix from theirs. I would strong recommend against anyone getting any of the Warlord Greeks. 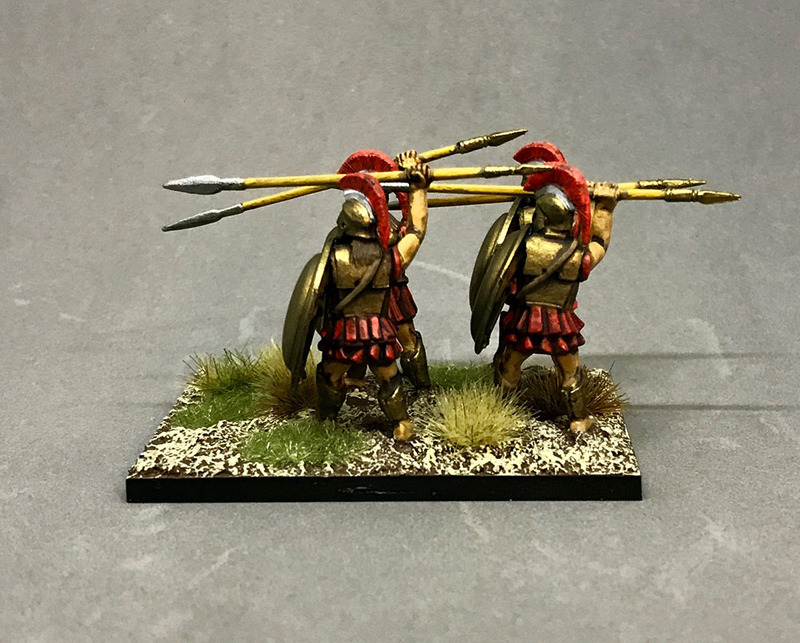 I plan on using the Hail Caesar rule set, and while it recommends 40mm x 40mm bases for 4 figures, I decided on using 40mm x 60mm to allow for some extra ground work in front of the figures for both looks and protection of the spears. Since I plan of painting at least 10 units of these over time, I wanted to keep the paint jobs very simple and quick so that I can get them done in a reasonable time. Therefore these were painted by simply blocking in the colours, washing and then highlighting. Super simple and basic table top level, as I don't know that you actually see much more than the shield from the front or some bronze and cloth from the back. I will however spend more time on the command stands for the game as you will be able to see the figures there. This first unit is 16 Spartans, of which probably 1/4 - 1/2 of my final force will be made up of. I also plan on making heavy use of units from Athens and Thebes. Outstanding ancient Greeks, wonderful job!